Susan Cooper (Melissa McCarthy) is an unassuming, desk-bound CIA analyst, and unsung hero behind the agency's most dangerous missions. She is also in love with her partner Bradley Fine (Jude Law). But when he falls off the grid and top agent Rick Ford (Jason Statham) is compromised, Cooper volunteers to go deep undercover to infiltrate the world of deadly arms dealer Rayna Boyanov (Rose Byrne). 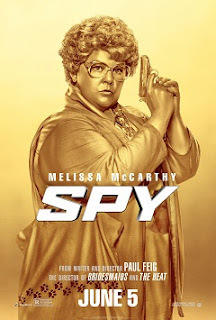 Carleton Rutter reviews Spy starring Melissa McCarthy, Jason Statham and Jude Law. Is it a savvy action espionage comedy or does it fire nothing but blanks? Check out the review to find out!